+ Sourcing fee 3048 ( 3048 + 11592 = ` 14640 ). The Arab-Israeli conflict has become an example of total disregard for international law by all parties involved, including the United Nations, to the detriment of a regional and global lasting peace. The conflict has contributed considerably to the erosion of the moral and legal authority of the United Nations, while the international community has failed to take prompt advantage of the East-West detente. Peoples with statehood - the Iraqis, Somalis, Yugoslavs - and even more those without - the Palestinians - paid a high price for the international lack of decisiveness. 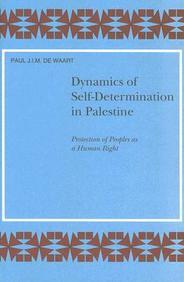 "Dynamics of Self-Determination in Palestine" discusses the Palestinian conflict in the light of the protection of peoples under international law. Chapter One treats the fact that the Arab states and the Palestinians have overlooked the element of negotiation in the keeping of international order, Chapter Two discusses the International Bill of Rights, in which the UN included self-determination in order to protect peoples against oppression, while Chapter Three expounds on the fact that, in doing so, it shaped the framework for the settlement of conflicting territorial claims to Palestine. The final chapter sets forth the desired UN participation in the creation of Palestine.